You may have thought that the £19bn ID cards project (see BOM's cost primer here) was safely asleep in the long stinging nettles, but it isn't. It's alive and well and already costing us plenty. 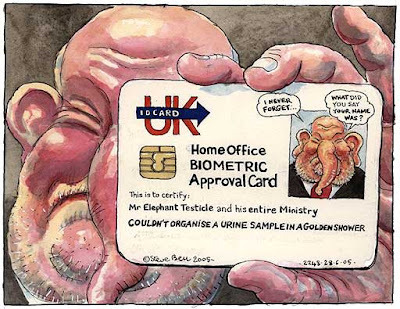 "The government has spent £53m on consultants for the national biometric identity card scheme, and continues to use 83 external contractors at a cost of nearly £50,000 per day. The figures are more than double the value of the original £19m pre-procurement consultancy contract signed in 2004, according to data released to Computing by the Home Office under the Freedom of Information Act." Why the cost over-run already? Turns out the technology and the specs aren't nearly as straightforward as Charles Clarke originally promised. Not. In May we surmised that moving from Clarke's original all-singing all-dancing all-weather scheme to a Heath Robinson lash-up would still cost plenty (and see the original LSE expert report here). As we've blogged before, the procurement deadline has already slipped by nearly two years (originally set for Oct 2005). But it seems the money fire is already roaring away nicely.